GM's response to the congressional ultimatum, just released, outlines a need for $12 billion in loans, plus potentially $6 billion later, and plans to reach profitability by pursuing "alternatives" to the Saturn brand and making Pontiac even less desirable. On the surface, the GM plan seems less ambitious than the Ford plan, though that may just be because GM already has an electric car coming down the pipeline. Their request for $12 billion seems relatively low given their cash situation, but there's a nugget hidden in the release where they mention an additional $6 billion if the market manages to tank even further. 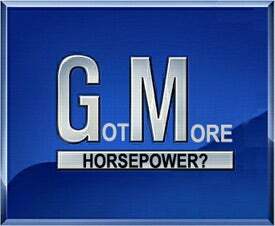 In the U.S., GM will focus its product development and marketing efforts on four core brands – Chevrolet, Cadillac, Buick and GMC. Pontiac will be a specialty brand with reduced product offerings within the Buick-Pontiac-GMC channel. Hummer has recently been put under strategic review, which includes the possible sale of the brand, and GM will immediately undertake a global strategic review of the Saab brand. As part of the plan, the company also will accelerate discussions with the Saturn retailers, consistent with their unique relationship, to explore alternatives for the Saturn brand. From this we understand Pontiac will either be made the performance brand they were supposed to be all along by nixing duplicate vehilces like the G3, G5 and G6 or made into a less fun crappy brand by axing the G8, G8 ST and Solstice. As for the part about Saturn, we'd be worried if we owned a Saturn dealership right now. Additionally, GM supports making more green vehilces and a government oversight board that would allow them to restructure (read "deal with union contracts") in a more efficient way. Full release below. WASHINGTON – General Motors Corp. today submitted a plan to use Federal bridge loans to create a leaner, more competitive company, one that is profitable and self-sustaining for the long term. * Further consolidation in manufacturing operations. GM is requesting term loans of up to $12 billion to provide adequate liquidity levels through December 31, 2009. GM anticipates an initial draw of $4 billion in December 2008. In addition to the bridge loans, the company is requesting a $6 billion line of credit to provide liquidity should a severe market downturn persist. GM’s intent is to begin to repay the loans as soon as 2011. Any draws would be conditioned on achieving specific restructuring requirements in the plan. To help expedite these actions and protect the taxpayers, GM is also seeking the creation of a Federal oversight board to oversee the loans and restructuring plan. GM is requesting the bridge loans and credit line because of a sharp industry-wide decline in vehicle sales. This decline, due in large part to tight credit and record-low consumer confidence, has led to a corresponding drop in dealer orders that is adversely impacting GM’s first-quarter production schedules, revenue forecasts, and liquidity outlook. Federal assistance would enable GM to weather a credit crisis that has driven U.S. industry sales to their lowest per-capita level in half a century, and help the company emerge fully competitive with all manufacturers operating in the U.S. The complete GM plan is available online . Following are highlights from the plan. Product Portfolio and Fuel Efficiency – GM has made significant progress in revamping its product lineup, with new GM cars like the Chevy Malibu, Cadillac CTS, Saturn Aura and Opel/Vauxhall Insignia earning car of the year awards.While remaining a full-line manufacturer, GM will substantially change its product mix over the next four years, and launch predominately high mileage, energy-efficient cars and crossovers. In addition, the Chevy Volt, which can travel up to 40 miles on electricity alone, is scheduled for production in 2010, and GM is planning other vehicles using Volt’s extended-range electric drivetrain. By 2012, more than half of GM vehicles will be flex-fuel capable, and the company will offer 15 hybrid models. GM will continue development of hydrogen fuel cell technology, which, when commercially deployed, will reduce automotive emissions to just water vapor. During the 2009-12 plan window, GM will invest approximately $2.9 billion in alternative fuels and advanced propulsion technologies, which offer fuel economy improvements ranging from 12 percent to 120 percent, compared with conventional gas engines. As a result, we expect GM to become a significant creator of green jobs in the United States, as well helping suppliers and dealers transform the U.S. economy. Market and Retail Operations – In the U.S., GM will focus its product development and marketing efforts on four core brands – Chevrolet, Cadillac, Buick and GMC. Pontiac will be a specialty brand with reduced product offerings within the Buick-Pontiac-GMC channel. Hummer has recently been put under strategic review, which includes the possible sale of the brand, and GM will immediately undertake a global strategic review of the Saab brand. As part of the plan, the company also will accelerate discussions with the Saturn retailers, consistent with their unique relationship, to explore alternatives for the Saturn brand. Manufacturing and Structural Costs – GM will accelerate its current efforts to reduce manufacturing and structural costs, building on significant progress made over the past several years. GM currently has the most productive assembly plants in 11 of the 20 product segments measured by the Harbour Report, and it is a global leader in workplace safety. With the recently negotiated wage rates, turnover expected in our workforce, planned assembly plant consolidations, further productivity improvements in the plan, and additional changes to be negotiated, GM's wages and benefits for both current workers and new hires will be fully competitive with Toyota by 2012. Balance Sheet Restructuring – Under the plan, GM would significantly reduce the debt currently carried on its balance sheet. GM plans to engage current lenders, bond holders and its unions to negotiate the needed changes. GM’s plan would preserve the status of existing trade creditors and honor all outstanding warranty obligations to both dealers and consumers, in the U.S. and globally. Compensation and Dividends – The plan calls for shared sacrifice, including further reduction in the number of executives and total compensation paid to senior leadership. For example, the chairman and CEO will reduce his salary to $1 per year. The plan also requires further changes in existing labor agreements, including job security provisions, paid time-off, and post-retirement health-care obligations. The common stock dividend will remain suspended during the life of the loans. Temporary Federal Bridge Loans – GM is seeking a term bridge loan facility from the Federal government of $12 billion to cover operating requirements under a baseline forecast of 12 million U.S. industry vehicle sales for 2009. In addition, GM is seeking a revolving credit facility of $6 billion that could be drawn should severe industry conditions continue, resulting in sales of 10.5 million total vehicles in 2009. This bridge loan is expected to be fully repaid by 2012 under the baseline industry assumptions. Also, warrants issued as part of the loans would allow taxpayers to benefit from growth in the company’s share price that might result from successful completion of the plan. Once GM has completed the restructuring actions laid out in the plan, the company will be able to operate profitably at industry volumes between 12.5 and 13 million vehicles. This is substantially below the 17 million industry levels averaged over the last nine years, so it is considered to be a reasonably conservative assumption for gauging liquidity needs. Federal Oversight Board – Given the importance and urgency of this restructuring for GM, other domestic manufacturers and the U.S. economy as a whole, the company supports the formation of a Federal oversight board. The board would help facilitate restructuring negotiations with a range of stakeholders. General Motors and its management are committed to the success of the plan summarized in the Congressional submission. The company’s responsibility to its customers, shareholders, employees, retirees, dealers and suppliers is well recognized, as is its century-long commitment to our nation. GM has never failed to meet a Congressional mandate in the important areas of fuel efficiency and vehicle emissions. We are among the leaders today in fuel efficiency, and set the industry standard for green manufacturing methods. We are committed to meeting the new fuel economy requirements of the 2007 Energy Independence and Security Act. The company’s role in creating green technology and high-paying jobs of the future will increase substantially as a result of implementing the plan. GM is proud of its century of contributions to the growth of our nation, and the company looks forward to making an equally meaningful contribution over the next century.